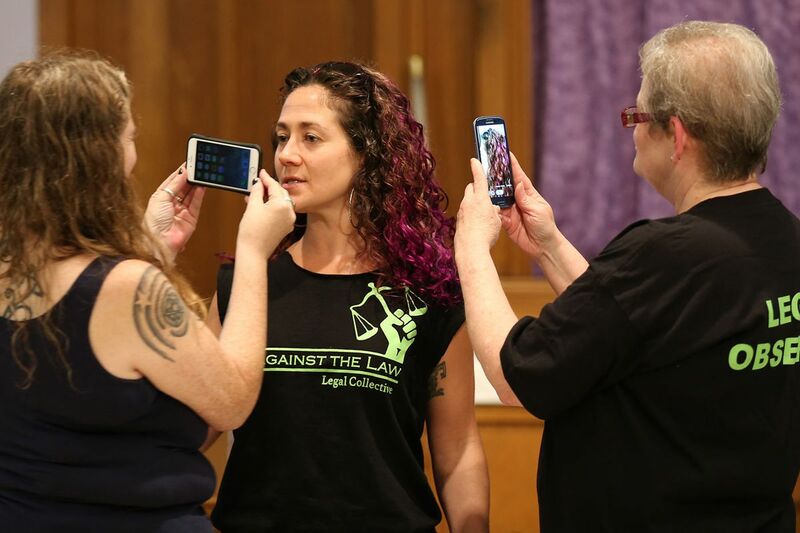 Aine Fox, left, and Jody Dodd, right, use phones to record during a role playing session with Amanda Spitfire, center, for those planning to protest during the Democratic National Convention later this month. "Cops will do and can do whatever they want" - but be prepared anyway. That was the message Saturday afternoon - not at a protest, but at training to prepare for one - at the Arch Street United Methodist Church. It was the first of four training sessions in preparation for the Democratic National Convention. About 50 people - mainly white, of mixed ages, and looking forward to demonstrating - gathered at the church on North Broad Street to discuss filming the police, supporting people who are jailed for protesting, and knowing your rights if you're one of them. Although planned in advance, the training played out amid nationwide protests over deaths of black men by police and of white officers by a Texas sniper - and a few hours before a raucous gathering outside two Philadelphia police stations five miles north. The Democratic convention is likely to start in a volatile atmosphere in two weeks, said Aine Fox, a member of the Up Against the Law Legal Collective, which hosted the training. "People's passions and emotions are more heightened than in the past," Fox said. The collective, a Philadelphia-based activist group born out of the Occupy movement, plans to offer round-the-clock legal assistance and support before, during, and after the convention. Its 14 members and supporters will have a team of 35 lawyers available to represent people who are arrested, member Amanda Spitfire said. Protesters are encouraged to call its hotline (484-758-0388) to report arrests and allegations of police misconduct. They made a point of saying that people of color, the disabled, transgender people, and those who are undocumented face a higher risk of arrest. When "copwatching" - filming a police encounter - the safety of protesters should be top priority, said Spitfire, one of the presenters: "Your goal in that moment is not agitation; it is protecting the person who is being harassed." Get protesters' legal names and dates of birth to aid legal support efforts, she said. "You're not going to be [read your Miranda rights]," presenter Jody Dodd warned. "They're going to take you to jail." In a departure from the widely distributed videos of recent shootings by police, presenters encouraged attendees to not put anything on social media that they would not say to a judge. This, they said, would help ensure a fair legal process. Brianna Jones, 31, is the director of the Democratic National Convention Action Committee, a coalition that also plans to support demonstrators. She said she attended Saturday's training in order to express her committee's solidarity with "more militant" protesters. "We expect the numbers will be larger than any Facebook event implies," Jones said. "Be on the street, be loud, be beautiful, and be boisterous."